The North Sea, the Black Sea, and the rivers in between are the focus of this memorable cruise along the magnificent Rhine, Main, and Danube Rivers. Relax and enjoy as you cruise past quaint villages, taking in the scenery and learning about the history. Cruise through Amsterdam’s lovely canals, past castles on the romantic Rhine and along the Main Danube Canal. Sail through the dramatic Iron Gates gorge, and take small boats to explore the Danube Delta, a UNESCO World Heritage Site. Enjoy included guided sightseeing in each city—Cologne, Würzburg, Bamberg, Nuremberg, Regensburg, Vienna, Bratislava, Budapest, Vukovar, Belgrade, Constanta, and Bucharest. Spend time in the charming wine village of Rüdesheim, and explore Bucharest, Romania’s lively capital. Other highlights include a visit to Belgrade’s Kalemegdan Fortress, the Tsarevet's Fortress in Veliko Târnovo, as well as an introduction to some of Germany’s famous beers in Nuremberg and wine tasting in Hungary’s Villány region. This is a vacation of a lifetime! Welcome to Amsterdam! Holland’s capital is sophisticated and modern, with a rich and fascinating history. This delightful 700-year-old city with its elegant and classic architecture, cafés and restaurants, and lively marketplace has a distinct ambiance. The streets, squares, and canals—not to mention the bike paths throughout the city—make for a vibrant atmosphere. Early this afternoon why not take an optional excursion to Zaanse Schans, with its traditional houses and workshops of Dutch crafts. Later, board your river cruise vessel and meet your crew at an evening welcome reception. There is no better way to see Amsterdam than by CANAL BOAT, cruising through the elegant grachten lined with stately homes dating back to Amsterdam’s “Golden Age.” There’s free time this afternoon to explore or maybe to join an optional biking excursion (weather permitting). Afterward, bid tot ziens (farewell) to Holland and set sail for Germany. Today, enjoy some peaceful cruising before reaching Cologne. One of Germany’s largest cities and capital of the Rhineland, Cologne straddles both sides of the Rhine, and is known for its soaring, twin-steepled gothic cathedral. Choose between a GUIDED CITY WALK or a JEWISH HERITAGE WALK. Later, during free time, perhaps look in on the Romano-Germanic Museum, home to a large collection of artifacts from the Roman settlement on which modern Cologne is built—a must for history buffs! Be sure to try a Kölsch pale lager, locally brewed in Cologne for over a hundred years! The dramatic RHINE GORGE is the most beautiful stretch of river. Here, ancient castles stand sentry on lofty cliffs rising 400 feet above the waters. Cruise past the legendary rock of the Lorelei, where enchanted siren song lured unwitting sailors to their doom, before arriving in Rüdesheim, the quintessential Rhine Valley wine town. Visit SIEGFRIED’S MECHANICAL MUSICAL INSTRUMENT MUSEUM, where you’ll see and hear a large collection of self-playing calliopes and music boxes from the 18th to the early 20th centuries; and enjoy a SPECIAL TREAT. Wertheim. Relax on board until your afternoon arrival in Wertheim, where a GUIDED WALK shows you its medieval center. Enjoy an included TASTING of local specialties and free time before departing for Würzburg. Surrounded by hillside vineyards, Würzburg, the “Pearl of the Romantic Road,” makes an immediate impression with Marienberg Fortress perched above town and its 15th-century Alte Mainbrucke (Old Main Bridge). On your GUIDED SIGHTSEEING TOUR, visit the magnificent BISHOP’S RESIDENZ, home to the largest ceiling fresco ever painted. During afternoon free time, consider joining an optional excursion to medieval Rothenburg. Enjoy a leisurely morning on board as you cruise along the Main River. Before lunch, attend a fascinating ONBOARD LECTURE to learn about the European Union. This afternoon, arrive in medieval Bamberg, former residence of one of Germany’s most powerful imperial dynasties. Your GUIDED WALKING TOUR takes in its historic center, including the great 13th-century Romanesque cathedral and the fascinating Altes Rathaus (Old Town Hall), built on an island in the middle of the Regnitz River when the bishop refused to give the townspeople land for a town hall! Wander the serpentine streets with their charming homes and 18th-century mansions. Although 90% of Nuremberg’s Old Town suffered extensive damage during WWII, much of it has been restored to the glory it once knew as the unofficial capital of the Holy Roman Empire. 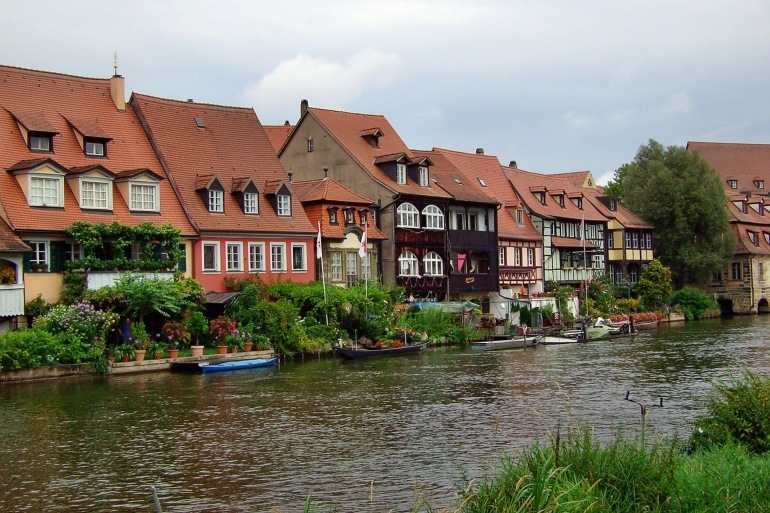 This morning, choose either a GUIDED SIGHTSEEING TOUR and marvel at this thousand-year-old city’s medieval fortifications, extraordinary gothic churches, and the Kaiserburg (Imperial Castle), or join a more specialized “NUREMBERG RALLY GROUNDS” tour. During free time, be sure to try some tasty Lebkuchen and make a wish at the beautiful fountain in the Hauptmarkt (main square). Legend says your wish will come true if you turn its gold ring three times. This afternoon, relax on board and attend an interesting LECTURE about the engineering marvel that is the Main Danube Canal. Before dinner, we’ll introduce you to some of Germany’s FAMOUS BEERS. Dating back to the time of the Celts around 500 BC, Regensburg is one of Germany’s best preserved medieval cities. Highlights of your GUIDED WALK this morning include the Altes Rathaus (Old Town Hall), built in the 13th century, and Porta Pretoria, gates to a Roman fort built in 179 AD. In the Middle Ages, many mansions were built with high towers to emphasize the prestige of their owners—many remain today. Grab a beer and enjoy an included SNACK at the Historische Wurstküche (Old Sausage Kitchen), one of Germany’s oldest restaurants. This morning your LOCAL GUIDE will acquaint you with Linz, Austria’s third-largest city and an important river port. See the 13th-century Hauptplatz, Austria’s largest medieval square, and the Trinity Column, built in 1723 as thanks for the city escaping the ravages of the plague, war, and fire. Maybe wander around the old castle grounds and take in the beautiful views of the river, or visit the neo-gothic New Cathedral, the largest church in Austria, with capacity for 20,000 visitors. In the late afternoon, arrive in the attractive country resort of Grein, nestled at the foot of a bluff in the shadow of its castle. Join a Local Guide for a GUIDED WALK and take pictures of the turreted houses on the main square. Its castle is the oldest residential castle in Austria, and its THEATER—built in 1791—is Austria’s oldest theater. Alternatively, you might like to join a full-day optional excursion to Salzburg; or the popular “Romantic Austria” tour; or to Český Krumlov in the Czech Republic, a UNESCO World Heritage Site. Rejoin your ship in the late afternoon in Grein. This morning, cruise through the picturesque Wachau Valley before arriving in Dürnstein. The magnificent baroque Stiftskirche with its blue façade is without a doubt the landmark of this small town. A Local Guide will take you on a WALKING TOUR and tell you the tale of England’s King Richard the Lionheart, who was imprisoned in the castle whose ruins still stand above the town. This evening, arrive in Vienna, where an optional concert is available tonight. Once the center of the mighty Habsburg Empire, Austria’s magical capital on the Danube is a showcase of gilded architecture. This is home to the lavish Hofburg Imperial Palace complex with its Vienna Boys’ Choir and dazzling Lipizzaner stallions; the neo-renaissance Vienna Opera House; and awe-inspiring St. Stephen’s Cathedral—plus, countless other sights on your included GUIDED TOUR. Shop in the delightful pedestrian Kärntnerstrasse, and be sure to enjoy a piece of decadent Sachertorte or Apfelstrudel in one of the classic Viennese coffee houses—historic institutions that helped shape Viennese culture! This morning you can relax and take it easy. Either stay on board and enjoy a leisurely cruise to Bratislava or spend more time in Vienna on your own, joining a motorcoach transfer to Bratislava in the early afternoon. The capital of Slovakia, Bratislava is situated at the foothills of the Carpathian Mountains. Arrive here in mid-afternoon and join your Local Guide for a tour of the city, including a GUIDED WALK of its fascinating cobblestoned Old Town with its Town Hall, one of the oldest stone buildings in the city. Also visit gothic ST. MARTIN’S CATHEDRAL, coronation church for the Kingdom of Hungary from the 16th to 19th centuries. Spanning the banks of the Danube, Budapest is one of Eastern Europe’s liveliest cities. Whether you’re seeing the sights, shopping for handcrafted embroidery or Herend porcelain, or basking in the coffee house culture over a rich cream cake in the renowned Gerbeaud Café, Budapest’s unique energy is positively palatable. On an INCLUDED TOUR with your Local Guide, see Heroes Square as well as the massive hilltop castle complex with its remarkable Fishermen’s Bastion and 11th-century Matthias Church, the coronation spot of several Hungarian monarchs. Be sure to note the city’s eight bridges—many famous sights in and of themselves—which connect ancient Buda on the right bank with Pest on the left. You may even want to walk across Chain Bridge built in 1849, and a symbol of Budapest. Enjoy tranquil cruising through southern Hungary before arriving in Mohács. From here, an excursion takes you to the Villány district, where some of Hungary’s best red wines are produced. As you enjoy a WINE TASTING, learn about which varietals are grown and why the climate and soil conditions are ideal for wine production. Today, learn more about the complex history of Croatia and the events that led to the Croatian War of Independence. Accompanied by LOCAL GUIDES, explore Osijek, an important economic and cultural center, as well as Vukovar, Croatia’s largest river port. Vukovar was scene to an 87-day siege in 1991, known as the Battle of Vukovar, and is today considered a symbol of Croatian resistance. The siege and other dramatic events in the recent past have shaped both the present and the future of this region. Early this morning, arrive in Belgrade, one of the oldest cities in Europe and capital of Serbia. A LOCAL GUIDE will show you its main sights, including St. Sava, the world’s largest orthodox church. Also visit the city’s principal landmark, KALEMEGDAN FORTRESS, which showcases the history of Belgrade. Built in stages between the 1st and 18th centuries, the fortress witnessed many battles and observed the courage of those trying to defend the city from conquerors. In your free time, check out the city’s lively pedestrian area and charming outdoor cafés, visit one of the many art galleries or museums, or browse the local shops. This morning, dock at Donji Milanovac, where a short drive takes you to the impressive LEPENSKI VIR EXHIBITION CENTER, which houses area archaeological artifacts and has unique views of the Danube Gorge. Return to your ship before lunch, then cruise what must surely be the most spectacular scenery of the dramatic IRON GATES gorge, a narrow and formerly very dangerous passage dividing Europe’s Alps in the northwest from the Carpathians in the southeast and forming a natural border between Serbia and Romania. The ancient Bulgarian capital of Veliko Târnovo is a comfortable ride from the Danube. Situated on three hills surrounding the Yantra River, the city was a natural fortress with ancient stone houses clinging to the steep slopes. One of the oldest towns in Bulgaria (dating back to 4300 BC), the oldest part is Tsarevets Hill, home of the Royal Fortress, palaces, and the PATRIARCH’S CHURCH. With your Local Guide, discover this town that played an important role in Bulgaria’s history. Then, journey to Arbanassi. Founded in the 15th century, the historic village is best known for its examples of Bulgarian Revival architecture and its ETHNOGRAPHICAL MUSEUM, a 400-year-old house preserved as a museum. Visit the CHURCH OF THE NATIVITY, one of the oldest churches in Arbanassi, and see its outstanding collection of frescoes. Rejoin your ship in Rousse, Bulgaria’s largest inland port. If you do not wish to participate in the full-day excursion, remain on board and relax, then join a GUIDED TOUR of Rousse this afternoon. Relax on board and enjoy a peaceful morning of cruising. Before lunch, learn about the Danube Delta at a fascinating ONBOARD LECTURE. This afternoon, dock in Tulcea, the “gateway” to the Delta. There’s time to explore on your own and maybe visit the Delta Museum. In the late afternoon, your ship sails for St. Gheorghe. From St. Gheorghe this morning, an excursion on small boats takes you into the DELTA, the best preserved of Europe’s deltas, hosting over 300 species of birds and 45 species of freshwater fish. From its source in the Black Forest to its delta at the Black Sea, the Danube is 2,845 kilometers long. The Km markings can be clearly seen on the river banks the length of the river. Enjoy a small celebration to mark Km “0”—the end of the Danube’s journey. This afternoon, relax as you sail to Cernavodă. This morning, dock in Cernavodă, a city at the western end of the 40-mile-long Black Sea Canal, the pride of communist achievement. You may choose to take an included full- or half-day excursion to Constanta on the Black Sea, the most important commercial center in Romania. A Local Guide shows you the city highlights, with a visit of the NATURAL HISTORY & ARCHAEOLOGICAL MUSEUM. Visit a WINERY at Murfatlar before returning to Cernavodă in the late afternoon. Alternatively, you may want to relax on board in the morning and visit Constanta in the afternoon only. Sail overnight to Oltenita.